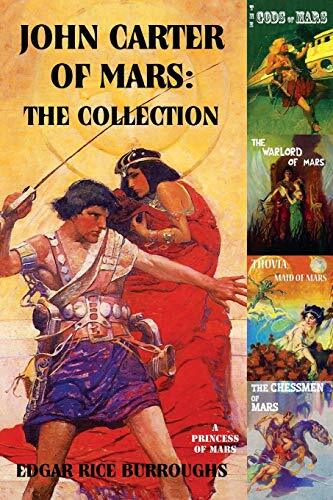 This Purple Rose book is a collection of the first five stories in Edgar Rice Burroughs' Barsoom series: A Princess of Mars (1917), The Gods of Mars (1918), The Warlord of Mars (1919), Thuvia, Maid of Mars (1920) and The Chessmen of Mars (1922). It contains all of the original frontispieces by Frank Schoonover and J. Allen St. John, enhanced and enlarged and is a high quality book with clear formatting and detailed contents. Visit Purple Rose at www.purplerosebooks.com and view our other titles and new releases. John Carter is the hero of Burroughs' Barsoom series. He first appeared in Under the Moons of Mars (later retitled A Princess of Mars) the story which catapaulted Burroughs into the limelight. It was the first of many novels and several sequels followed over the next three decades, further extending Burroughs' vision of Barsoom. The world of Barsoom is a romantic vision of a dying Mars, based on now outdated scientific ideas made popular by Astronomer Percival Lowell in the early 20th century. While depicting many outlandish inventions, and advanced technology, it is a savage, 'frontier' world, of honor, noble sacrifice and constant struggle, where martial prowess is paramount, and where many races fight over dwindling resources. It is filled with lost cities, heroic adventures and undiscovered ancient secrets. The series has inspired a number of well known science fiction writers, and also key scientists involved in both space exploration and the search for extraterrestrial life. It has informed and been adapted by many writers, in novels, short stories, television and film.